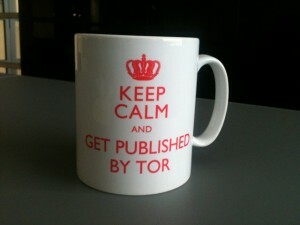 So, a week on from Tor acknowledging me as part of the League of Tor Authors, and it’s been pretty damn amazing. It is a learning curve, going from blogger and fan to noobie debut author. 1. smile so much I had to go buy stronger face cream to combat the wrinkles that seemed to set in overnight. 2. say thank you to what seems to be a thousand people online and in real life. 3. have grown up conversations about an author photo. 4. scour my pinterest boards and set up super secret pinterest board loaded full of covers of books I love, images I love to hand over to Tor’s design team. 5. I signed up to be part of onefourkidlit.com as they invited me along – this is truly flattering. 6. got invited to be part of a UK based kidlit author blog being set up – this is so exciting my mind boggles – also: flattering. 7. evaluate reading time vs writing time vs “down” time and realised for real that there is now no longer down time. 8. wrote around 5 thousand words over 4 days on book2 and kinda hoping I’m not screwing it up. 9. got emails from my family that, although they are thousands of miles away, made me feel loved and amazing. 10. started working very hard on the second bedroom to pull it into some kind of order so that Mark and I have a room that will be inhabitable if friends need to stay over. 11. tell people I work with about the deal and explain to them a bazillionty times that no, I am not JK Rowling or JRR Tolkien. Geez! 12. how incredibly exciting and yet frightening it is when people you know well and who you’ve met as a blogger (and they are either a blogger or an author whom you’ve long admired) and they say: really looking forward to reading it when it’s published. And then your brain goes into melt-down. 13. still, with the smiling and wrinkles. 14. remember to buy more waterproof mascara as it turns out I go all emo when I get good news. Please, weather gods, get it sorted, right? <3 it, Mieneke! Conquering the world, one cup of tea at a time. Amazing news Liz!!! You go, girl. & plse contact me. I’ve been trying desperately to get hold of you!